The Den-Con HMB Hinged Pin Drive master bushing is available for 37 1/2" - 60 1/2" rotary tables. The 49 1/2" - 60 1/2" HMB is rated 750 ton. The 37 1/2" - 49 1/2" HMB is rated 500 Ton. Removable 500 ton, 4 taper split insert bowls are available for both models to allow handling capability for 2 3/8" to 13 3/8" tubular products. 750 ton, 4 taper insert bowls are available upon request for the 49 1/2" - 60 1/2" HMB. 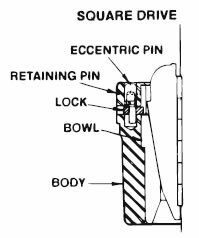 The HMB can easily be removed from the drill string by removal of one hinge pin. The Den-Con 27 RPH Roller Kelly Bushing is the drive bushing used with HMB 37 1/2" - 49 1/2". The Den-Con SPB Solid Body Pin Drive master bushing is available for 20 1/2" - 27 1/2" rotary tables and is rated 500 ton. Removable 500 ton, 4 taper split insert bowls are available to allow handling capability for 2 3/8" to 13 3/8" tubular products. Refer to parts tables for casing bowls and sizes. 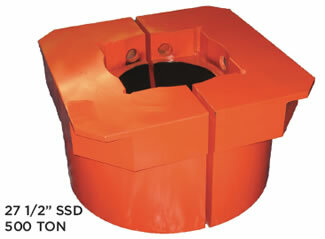 The Den-Con SMB Split Pin Drive master bushing is available for 17 1/2" - 27 1/2" rotary tables and is rated 500 ton. The SMB is a split master bushing with the API 4 taper machined into the body halves to handle 8 5/8" & smaller tubular products. This bushing is a split design to eliminate the need to strip over the master bushing while running large tools during surface hole work. The SMB does not allow for use of removable insert bowls. All of the pin drive master bushings have Pin drive hole locations to API dimensions. The Den-Con HMB Assembly, Parts and Bowls are interchangeable with Varco MPCH Bushings. The Den-Con SPB Assembly, Parts and Bowls are interchangeable with Varco MSPC Bushings. Specify rotary table make, size and type when ordering. *See Adapter Ring Data Table (page 18) for additional details and configurations. *See Adapter Ring Data Table for additional details and configurations. The Den-Con SSB Solid Body Square Drive Master Bushing is available for 17 1/2" to 27 1/2" rotary tables and is rated at 500 ton. The drive square is the same API dimension found in all square drive master bushings. The SSB is designed with removable insert bowls. The Den-Con SSD Split Square Drive Master Bushing is designed as a replacement bushing for all original O.E.M. manufactured bushings. This bushing is available for 17 1/2" to 27 1/2" Rotary Tables and is rated at 500 ton. All bushings have the standard API 4 taper to handle 8 5/8" and smaller tubular products. Drive Hole Bushing Replacement-Pin Drive Bushings. 2. Clean out drive holes, remove any rust and deburr the top edge. Note: Place new drive hole bushing in a freezer to shrink. 1. Preheat the Master Bushing body around the drive hole area to 400-500°F. 2. Take drive hole bushing from freezer and place bushing in ice until ready to install. 3. Press drive hole bushing, chamfered end up, until flush with top of master bushing body. 4. If no press is available, make sure Master Bushing drive hole area is at the proper temperature. as possible using a sledge hammer. XT - Indicates Extended Taper Bowls available as options. See page 16 for 49 1/2” HMB Bowls and Slips detail. See the Rotary Equipment Data Table for 49 1/2" Bowls and Slips detail.